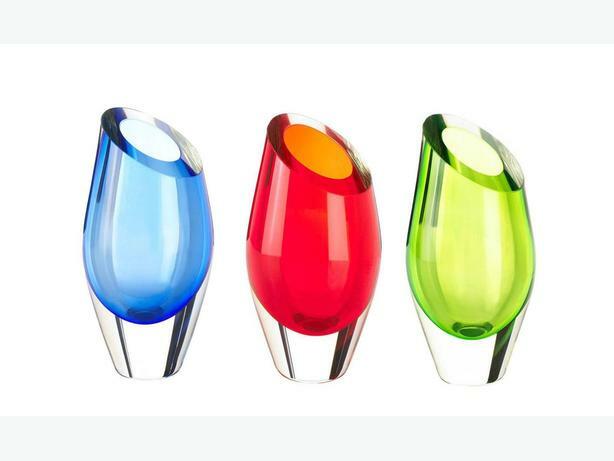 Bring a burst of color to any room with these striking glass vases with unique angled-top. They're just as spectacular empty as they are with a fresh bouquet...set near a window and watch as sunlight streaming through them makes them even more beautiful or add your favorite blooms for a breathtakingly focus piece! Price is for **Your Choice** of any 2...mix & match or choose both the same, they make a fantastic gift. They're all 5" x 5" x 9.5" tall.